Cartage Theatre is committed to bringing theatre to you. Wherever and whenever. A little bit of space and an audience is all we need to share something vital. 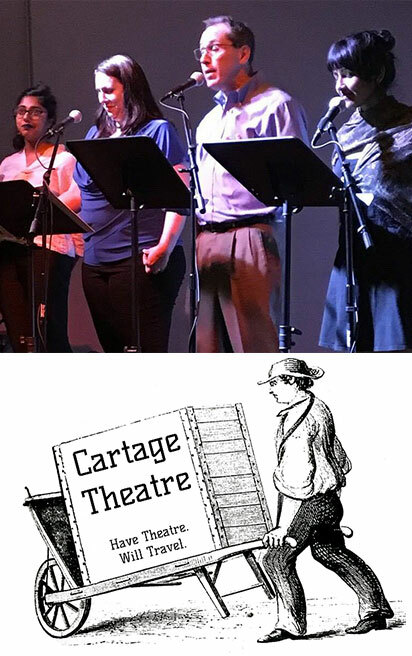 Cartage Theatre was created in the fall of 2017. We specialize in bringing live audio theatre to the Charlotte audience, featuring Charlotte playwrights and Charlotte performers. We use actors and sound effects created live onstage to create a unique theatrical and storytelling experience. North Carolina enjoys a rich and varied folktale heritage, with a wealth of excellent storytellers. Folktales stretch recollections of everyday occurrences into stories of the stupendous and the supernatural. We put out the call for submissions to North Carolina writers for short audio dramas based in some way on North Carolina Folktales, and will weave these stories into a unique evening of storytelling and theatre.